Take them outside for a proper dusting OR use your leaf blower to air dust them. When you bring them back inside, be sure to ROTATE them in a different direction to help with wear and traffic patterns. Is your vacuum working great? When was the last time you cleaned it out? Swap out the bag or clean out the canister, check for obstructions or HAIR and this will help you clean more efficiently. Use the upholstery attachment to vacuum your sofas, chairs, drapes and other big items that don’t get vacuumed frequently. Push those sofas and chairs back and vacuum underneath them. Spring cleaning is all about getting to those areas we often neglect. FUN FACT! The Greek meaning is “mouse’s ear” which is indicative of the shape of the flower petals themselves. 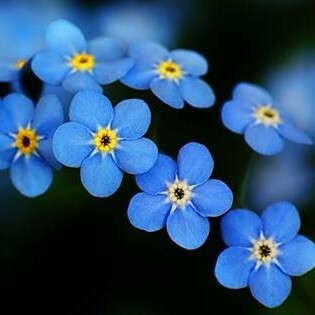 The “Forget Me Not” name comes from the famous German MYTH about two lovers who were walking along the Danubi River when they spotted the pretty blue flowers. As the man retrieved the flowers for his love, he was swept away by the river and shouted out that she not forget him. One local school received a FREE cleaning for their Kindergarten “story-time” rugs while the kids were out for Spring Break. 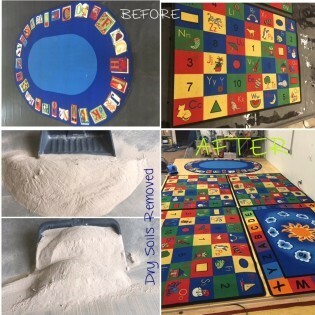 We have fun with this project every year trying to see how much dry soil we can remove from these rugs. Let’s just say there is A LOT of sand, LOL! This is part of our Annual project for “Carpet Cleaners Give Back”. We are happy to help promote cleaner, healthier spaces for our kids and teachers. DO YOU NEED TO CALL IN THE PROS FOR SOME HELP WITH YOUR SPRING CLEANING? AREA RUGS: cleaning, protector, pad, repairs, storage & MORE! HARD SURFACE FLOORS: tile/grout, travertine, natural stone, wood, laminate, LVT/LVP and MORE!